As online marketing continues to mature and all un-owned media becomes more competitive (increasing CPC, more emails going to spam, and more challengers for top organic rankings), user experience and conversion rate optimization (CRO) of owned media has become a mainstream priority for ensuring revenue and lead growth. Rather than competing against the entire digital world, UX and CRO are focused on outpacing your organization’s preexisting benchmarks and more importantly, your customer’s expectations. While some may expect industrial B2B companies to retain their 20th-century websites and generally lag behind their B2C counterparts, manufacturers and other contributors to industrial supply chains face similar competitive challenges that have pushed them to keep up with digital trends. For commodity products early in the supply chain, competition is particularly fierce and differentiation can be tough to come by. Making the most of the onsite experience is key to winning over traffic and generating new leads for the sales pipeline. Even improvements that create incremental increases in key performance indicators (KPIs), such as total leads or conversion rate, help make the margins that establish return on investment (ROI). 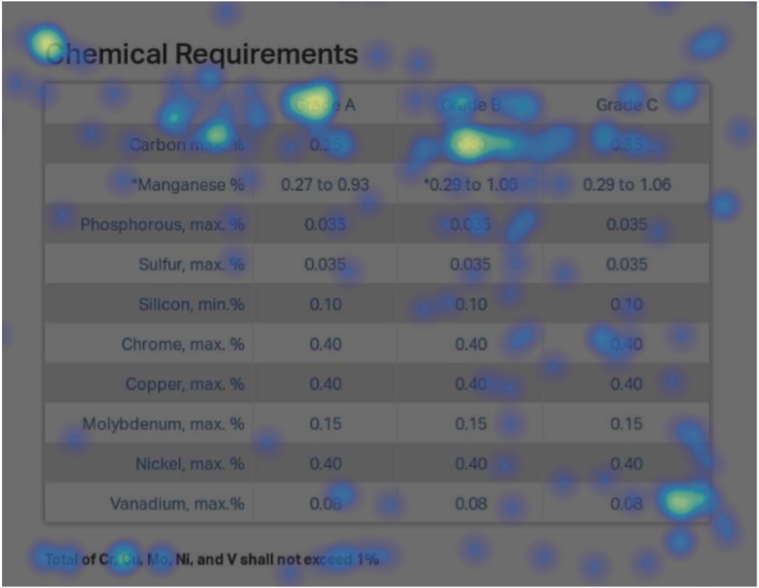 Gorilla 76 helped a commodity client identify trends in user’s behaviors with heat mapping software and made improvements to the user’s experience that increased total leads by 36% and the overall conversion rate to 2.47%. For commodity markets like steel piping, success lies in the margins. A website infrastructure that dominates in online search and lead generation is a strong means to making that margin. This client’s success in search engines has resulted in an average 24,416 users per month, 90% of which originate from organic search. Additionally, their quote request form and product catalog convert 1.2% of those users into leads with present interest and need for their pipe products. Both of these demonstrate an online marketing machine supporting the sales team and filling their pipeline. When the team is looking for growth and new opportunities, organic and paid media only go so far. It was time to look towards the site’s performance for improvement. Their website has a history of strong organic traffic, but if that traffic doesn’t complete a form, they become just another random site visitor. The challenge of earning an individual’s contact information is in building trust and delivering value in the context of their buyer’s journey. Building upon oneself is an ongoing process of analyzing and optimizing; establishing tracking tools, collecting data points, developing theories, testing those theories and then confirming or denying them. For website improvements, the process is the same. In this case, we set up tracking code for heat mapping of users’ click patterns across many of the site’s top pages earning thousands of organic visits. 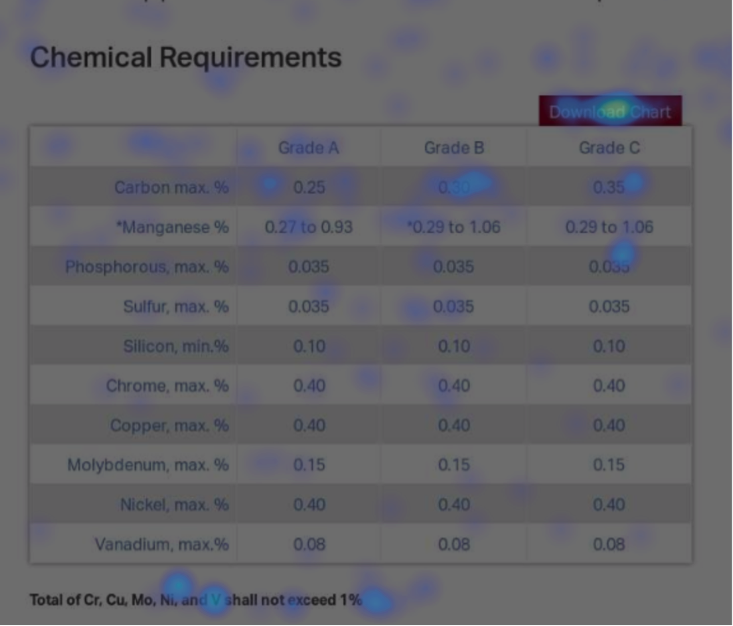 What was identified was an intriguing trend of hot spots in the corners of one pipe specification table on chemical requirements. Covering the breakdown of material standards that aligned with the ASTM-defined specification, this chart proved to be a key resource for engineers seeking to ensure this pipe type worked for their project. The minimum and maximum percentages of carbon and manganese were key to defining the grade of pipe needed for a project as well. So the concentration of attention on this table should come as no surprise, but the clicks focused on the corners suggested something new about the engineers referencing it. Here’s where the theory development comes in. After looking across the summary report of click patterns, we made a hypothesis. A click in the top left corner and the bottom right corner of a chart would potentially indicate a highlighting pattern, as if users are copying and pasting the information in their own offline notes for future reference. This idea appeared to be the most reasonable explanation and the direction we would pursue and test. Working under the assumption that users —engineers— sought this content out for future reference, how could the website offer additional value in that researching context? Most simply, offering a PDF version— where the formatting would remain intact and we could include a footer with contact information for follow up— would address the immediate needs of a researching project engineer. In addition to aiding the engineer, aiding the business by addressing its goal of identifying new leads who would value the pipe distributor’s expertise and pipe supply was required for this change to be a success. While the PDF would be published and listed in close proximity to the chart (a tab attached to it, in fact), adding a brief form would allow the sales team to understand both who is seeking pipe and what type of pipe they are considering. The new PDF, now serving as a lead generating tool, produced a 36% increase in leads within the first quarter following its publishing, in addition to the preexisting Product Catalog and quote request forms. The conversion rate grew to 2.47% with 1 in every 40 visitors becoming a lead. Publishing the new PDF confirmed relatively quickly that it added significant convenience for those users referencing the chart. While the number of downloads was one indicator of success, the other confirmation would be a reduction in the number of users highlighting the table and copying and pasting its contents. A dominant shift in clicks from the top left and bottom right corners to the top right where the new download button sat reaffirmed the success of the change. Prioritize your opportunities by potential improvement, importance to business goals and ease of implementation (PIE). This opportunity was an ideal combination of great potential to impact KPIs with minimal effort to execute. Not all will be, so weighing options is key. Have your KPIs ready and available so your team knows what goals they’re focusing on and which of them are a priority. This client earns a significant volume of relevant and valuable traffic, but for traffic who lacked a present sales need, the bigger challenge was improving the conversion rate with new contacts that were earlier in their buying process. When strong website infrastructure is in place and is complemented with valuable, targeted content, knowing the next step to growth is not always immediate or easy. Looking towards data and further understanding your user are strong first steps to identifying improvements. It’s not low hanging fruit with massive returns, but when you’re working within the margins, it can make all the difference.